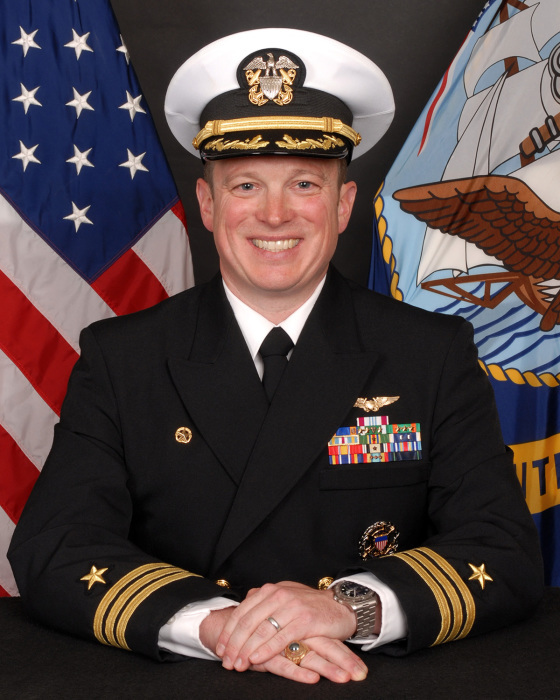 Commander Robert H. Eastman III, USN, Commanding Officer of Electronic Attack Squadron One Three Four, suddenly and tragically passed away of natural causes on February 2, 2019. He was 41 years old. With his passing, a wife has lost the love of her life, a brother his best friend, parents their first-born, and the nation a dedicated patriot. All who knew, loved, and served with Rob mourn his loss. Born on April 29, 1977 to Bob and Sally Eastman, Rob was raised in Shaftsbury, Vermont. He became a big brother to Christopher in 1979. Rob graduated from Mount Anthony Union High School, and was accepted to the United States Merchant Marine Academy. While a midshipman at Kings Point, Rob sailed on the M/V Sea Wolf, M/V Innovation, USNS Kanawha, and the USS Carl Vinson (CVN 70). Upon graduation he was commissioned and began his service in the United States Navy in 1999. Following flight training, “Detox” (as he would come to be lovingly called by his shipmates), earned his coveted Wings of Gold and with them, the privilege of being called a Naval Flight Officer. Rob was selected for training in the venerable EA-6B Prowler at Naval Air Station Whidbey Island, Washington. In 2002 he successfully completed fleet replacement training at VAQ-129 and was assigned to the Shadowhawks of VAQ-141, where he completed two deployments aboard USS THEODOORE ROOSEVELT (CVN 71). Due to his outstanding airmanship, he was selected to return to VAQ-129 to serve as a flight instructor. There, Rob distinguished himself as a steady and confident guide for student pilots attempting their first night carrier landings. He subsequently accepted orders to the staff of Carrier Air Wing Seven at Naval Air Station Oceana, Virginia, and deployed twice to the Middle East aboard USS DWIGHT D. EISENHOWER (CVN 69). He then returned to Whidbey Island and the Patriots of VAQ-140 for his department head tour, completing two more deployments – one to Aviano Air Base, Italy, and another aboard EISENHOWER. Following his time with the Patriots, Rob reported to the Pentagon and the Joint Chiefs of Staff. This tour proved to be life changing, both personally and professionally. During this time, he was selected for command of an EA-18G Growler squadron; but more importantly, he met his future wife, Sarah Mehlhaff. Rob and Sarah moved back to Anacortes in 2015 and he reported to the VAQ-134 Garudas as Executive Officer in December, 2016. After completing his seventh deployment, Rob assumed command of the Garudas in March 2018. Most recently, he had the distinct privilege of being selected to pursue nuclear power training and begin a path that would have led to command of U.S. Navy aircraft carrier. Rob accumulated 3,000 flight hours and over 500 carrier arrested landings. He proudly flew more than 100 combat sorties in direct support of coalition forces in Iraq, Afghanistan, and Libya. He was grateful to have served with outstanding Sailors, colleagues, and friends whose exceptional teamwork and performance enabled him to wear the Defense Meritorious Service Medal, Strike/Flight Air Medal (six awards), Navy Commendation medal (four awards, one with “V” for Valor), Navy Achievement Medal (four awards), two Battle ‘E’ awards, and various campaign medals. While Rob’s accomplishments and accolades are commendable, they tell but a small part of his story. He was a man with interests and hobbies as varied as the places he travelled. He was as comfortable on the slopes as he was on the water; just as happy to don a Carhartt jacket as a tuxedo; as appreciative of a can of cheap beer as a glass of fine wine. Rob was a marathoner, a skier, a boater, a chef, a student, a teacher, and equal parts hopeless romantic and cautious skeptic. Of all of these roles, two will most strongly define his legacy – he was a friend, and a leader. He was Sarah’s best friend. They met in Washington D.C. in 2013 and began dating shortly thereafter. Those closest to him quickly began to notice a spark in his eye whenever he spoke of her. Surrounded by family and friends they exchanged vows during a beautiful wedding in Seattle on July 18, 2015. In Sarah, Rob found a woman who is as kind, loving, and patient as a husband could ever ask. He earned and wore many titles, but that of husband is undoubtedly the one he treasured most highly and protected most fiercely. To aviators with silly names like CB, Rabbit, Combat, Village, Jimmy-the-King, T-Murf, Topper, and Dink-Dink, he was a friend without equal. Sarah may have owned his heart, but these friends surely rented it from time to time. Rob’s loyalty and compassion towards those he served, and served with, will be emulated for generations to come. Each of us who had the privilege of calling ourselves Rob’s friend is better for it. We understand the solemn responsibility we each carry to honor him and his legacy through continued selfless service and unwavering kindness. For those he led, there remains an equally important burden to carry – doing the right things for the right reasons. Rob cherished his opportunity to lead, appreciated his opportunity to command, and had an unshakable focus on the Garuda’s mission – all the while working tirelessly to ensure the safety and wellbeing of those in his charge. Continue to lean forward, hone your skills, and do the right things for the right reasons. That’s what Skipper Eastman expects of us. Rob is survived by his loving wife Sarah of Anacortes, Washington, his parents, Bob and Sally Eastman of Shaftsbury, Vermont, his brother Christopher and his wife Jillian and their children Alexander and Abigail of Syracuse, New York, his aunts, uncles and cousins, as well as countless friends and shipmates around the world. A memorial service was held aboard Naval Air Station Whidbey Island, Washington on February 26, 2019. Funeral service will be 11 a.m. Tuesday, August 27, 2019 at Arlington National Cemetery with full military honors. In lieu of flowers, the family kindly asks friends to consider a donation to the Tailhook Educational Foundation. Rest easy friend. We have the watch.